With its prime San Francisco location and unique blend of Eastern and Western influences. 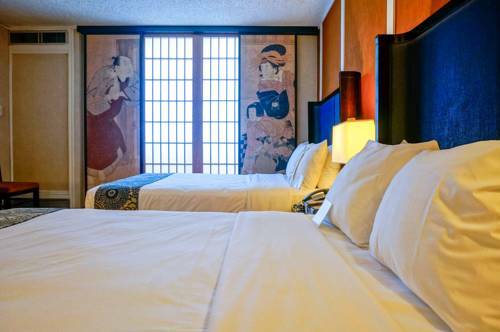 The Hotel Kabuki offers a calm and serene ambiance that is sure to please business and leisure travelers alike. The Hotel Kabuki is a pet friendly hotel. Please indicate Pet Room needed when making reservations. Rooms and Amenities The spacious guest rooms and suites at the Hotel Kabuki are quiet havens featuring soft natural lighting through rice paper screens deep Japanese tubs and elegant furnishing. In both its Western and Japanese-style rooms. The Hotel Kabuki features such amenities as free high speed Internet-voice mail-data ports- coffee makers-hair dryers and ironing boards. Hotel Services When it is time to relax guests at the Hotel Kabuki can arrange for an in-room Shiatsu massage or workout our in-house fitness center. Other services provided by the Hotel Kabuki include complimentary wireless Internet access a business center same-day laundry valet service and self-parking.